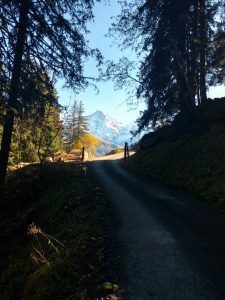 What I love the most about Switzerland is that you can find a hiking route anywhere. Literally, anywhere! You can simply walk around in the middle of the city and you will find one of those yellow rhombus signs on a street light, on a tree or anywhere else which basically tells you that if you follow that direction, you will get to some kind of path/trail which can lead you to another city, mountains, woods. Yes, you will still have to walk out from the city, which can be a long way, but after all you will reach some a trail where you can enjoy nature, mountains or whatever is on the way 🙂 So these yellow signs can be found even in Zurich, Geneve or any other city. 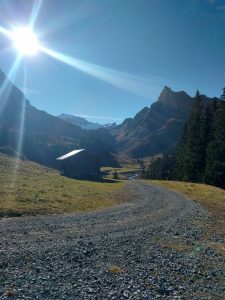 So, one day I was just driving in Switzerland and decided that I want to have a hike in the mountains. Simply as that. I knew that there some pretty cool mountains around Interlaken, so I drove little further from it, deeper into the valley, chose any turn to the right and got myself to a very nice and little town called Isenfluh which as I expected had a bunch of possibilities to hike around with very clear signs (most of those signs tell you the time you are going to spend walking to different destinations). So I just parked my car in a parking space next to this small town (actually you have to drive through the town to reach it, but it’s like 500m). For 4 hours parking you have to pay 5CHF and enjoy your time in the mountains. 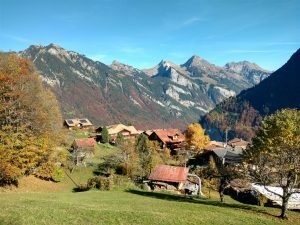 The town of Isenfluh is really pretty small and it is all situated on the slope of a mountain, so the locals have to walk on pretty steep paths to reach neighbours, school or any other building they want. The city itself is so peaceful, calm and has amazing views to the other side of the valley to other mountain faces. I just simply walked through the town and like in 200 m I reached signs which show paths up the mountain with different destinations. By the way, on the way to those signs I found a local shop which is selling Alpskäse (Alps cheese) which is pretty common in all those small towns 🙂 So for a few swiss francs you can enjoy some local cheese if you please. 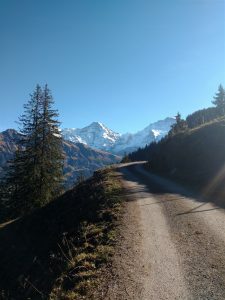 I simply chose any of destinations (I haven’t actually studied any of it before) and just kept walking up, enjoying beautiful views, mountains, some sheep running around – usual stuff in Swiss alps :)) This is why I love it in Switzerland. And you can’t actually get lost, if you are tired, just turn around and follow the signs back to your starting point. 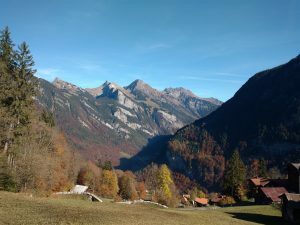 On the way to the valley you can find some waterfalls, some totally isolated houses, some huts, some small bridges, some benches to sit down and enjoy majestic Alps and much more nice stuff which makes the route entertaining (if you like such stuff, of course :D). In a valley you can find as well new directions and few huts which at that time was completely empty (I was there on November). The huts are quite old, you can actually see through the gaps between wooden planks what is inside, so it would be quite unbearable to live there during winter. And for sure, in winter they are not reachable by any transport, maybe just by snowmobiles. What is pretty cool, that all of those huts have solar panels, so I assume they use that power on summer then the owners come there to enjoy nice summer weather. Actually, not very far from that valley, just maybe an hour hike away, there is a hut which provides beds all year long (this is what they say on their website). If you go straight from Isenfluh to it, you can reach it in 2-3 hours. So it’s not too long or difficult and the views are amazing. The link to the hut is here: Lobhorn Hut. So my hike up the valley and back to Isenfluh took around 4 hours, I walked 16,74 km and made 1100 meters in elevation (up).